Video has been a life-changing experience for him; one guy wih a camera can make a difference and produce quality content. Individuals can harness the power of video now as compared to when you used to need a crew. Prior to his ability of working with video, B.J. said he didn’t think the editorial staff at the Washington Post found him as attractive. The unique thing that B.J’s company, Synthesis Multimedia Productions, provides is that when they do game story video packages, the stories are usually turned in around 2 hours after the game. B.J. has done a lot of things: radio, television, web, writing, video. And he recommends trying different things to learn what you’re good at. Invest in yourself. You’re not just a writer or broadcaster or radio host. You are a media person. Don’t peg yourself into doing one thing. Do all of it and you’ll be able to do what you want to do. If you’re not going to change you’re going to get left behind and if you only do one thing, you are easily replaceable. The most important thing for someone that works for him, is for them to be, at heart, a journalist. The #1 thing for B.J. is that you learn things by doing it. BJ gave advice to start at small paper a weekly paper to do an internship, you’ll learn much more when you are not in a huge company, and you can get more hands on and one on one experience. The Washington Post is too big of a company to be able to learn as much as you’ll need to know from them. Now is the time to get your mistakes out of the way when you can. BJ Koubaroulis, George Mason University graduate in ’04, began writing high school level sports, getting the most access and “real people” who enjoy doing what they’re doing. Work at a small place early to get learning experience and make mistakes. By doing so, you’ll gain experience and be able to get published without having extreme pressure and demand of needing to be perfect. He eventually focused his energy into adding another element into his repertoire in order to be able to compete better. He added a video element to his game which helped him stand out amongst his other journalists at the Washington Post. It gave him more power as a writer having another aspect to add to it. As important as it is to have unique abilities in one particular area, BJ made an important point to talk about the necessity of being able to do everything — writing, radio, television, video, internet. By being able to do everything, you’ll be able to do your one “specialty’ even better than you thought. If you’re unwilling to change, you will get left behind. He showed us a virtual tour that he created about Mason’s campus. It was incredibly cool to see. 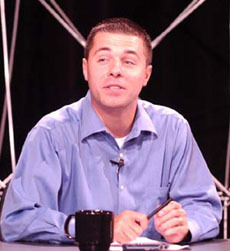 Former George Mason University Communications major B.J. Koubaroulis spoke to our class today about video techniques and how video can really enhance the story you are trying to tell. Visit his personal Twitter account here and check out his blog here. Koubaroulis reccommends starting out small after you graduate and working in a place that is more personal so that you are able to learn more from your experience and gradually work your way up to the big leagues. Koubaroulis believes this story from the Washington Post was the game changer for him. He was able to use video to really tell the story well and reach out to the audience, pulling them into the story with video. Koubaroulis started a company called Synthesis Multimedia Productions, which showcases a variety of “one-man band” video journalists who cover unique content and stories. The video stories are posted very quickly too — only about 2 hours after reporting! What are the four things that every video journalist needs to have according to Koubaroulis? Koubaroulis also showed us a few websites that incorporate interactive media platforms, such as Mason Metro. For information on buying camcorders and video equipment, Koubaroulis reccommends B&H. He is a fellow grad from mason and covered high school sports after that. How will you differentiate yourself from the people next to you? Give them something they need! He started a video production company and started hooking it up. Make your audience part of it. Make them interact. Take every and any opportunity you can do. Mac books are the bomb. Duh…. Work at a small local newspaper, either weekly or daily, to get the experience and advice from people who have been doing the things you want to do. Now-a-days with media, media companies want to hire people that can do the job of 5 other people. If your not going to change, you are going to be left behind. Do it all, don’t limit yourself. Do not rely on media. Love it, but don’t count on it. Computer, camera, microphone, ready to work hard. Most frustrating thing by the time you get a camera it is basically outdated. We are in a big hype of touchscreen. Touchscreen not only eliminates moving parts in electronics, but also opens up unlimited possibilities for more intuitive interface. With rising of touchscreen technology, therefore, many electronics manufacturers have begun implementing it in exhaustive lists of new products. Consumers like them too, as they convince you that you’re in charge of everything just on a fingertip. We now see them on computers, cell phones, cars, refrigerators and even microwaves (can’t believe it?). There are three different touchscreen technologies used to register the motion of your fingertips: Resistive, capacitive and surface acoustic wave. According to resistivetouchscreen.org, resistive touchscreen consists of two layers with small space in between. When a pressure is applied, the top layer touches the bottom layer, registering the combination of voltage and distance of the pressure point, and finds the X coordinate. And then, the same voltage gradient is used to find the Y coordinate. An excerpt from HowStuffWorks.com says that capacitive touchscreen uses a layer with electrical charge on top of the glass panel of monitor. When the pressure is applied, some of its electricity is transferred to the epiderm of of skin. The decreased charge is detected by circuits located in each corner of the layer, and the amount of decrease is registered as the distance in each circuit, interpreted as coordinates. Capacitive touchscreen generally transmits stronger signals than resistive touchscreen. Also, since it uses only one layer to detect pressures, it transmits 90 percent of light, providing better clarity of screen when compared to resistive touchscreen. The surface acoustic wave technology (SAW) is one of the most advanced touchscreen technologies to the date. It consists of two transducers each registering X and Y axis on the panel, which registers electrical signals from ultrasonic wave spread on the reflector on the panel, interpreted by the controller of the transducers. Because SAW does not overlay on the glass panel of monitor, it provides unaffected clarity of the screen. Also, it provides the strongest touchscreen sensitivity today.